Caterham Cars is a manufacturer of specialist lightweight Sports Cars based in Caterham, Surrey, UK. Their current model, the Caterham 7 (or Seven), is a direct evolution of the Series 3 Lotus Seven designed by Colin Chapman and originally launched in 1973. In the 1990s the company made the Caterham 21,a two-seater soft top alternative to the MGF and Lotus Elise, which both sold many more units. A track-only car, the SP/300.R, a joint project with Lola was released for customer testing in 2010 and is scheduled for release in 2013. On 27 April 2011, then-Team Lotus owner Tony Fernandes announced that he had purchased Caterham. "Kart racing or karting is a variant of open-wheel motorsport with small, open, four-wheeled vehicles called karts, go-karts, or gearbox/shifter karts depending on the design. They are usually raced on scaled-down circuits. Karting is commonly perceived as the stepping stone to the higher and more expensive ranks of motorsports. Karts vary widely in speed and some (known as Superkarts) can reach speeds exceeding 160 miles per hour (260 km/h), while go-karts intended for the general public in amusement parks may be limited to speeds of no more than 15 miles per hour (24 km/h). 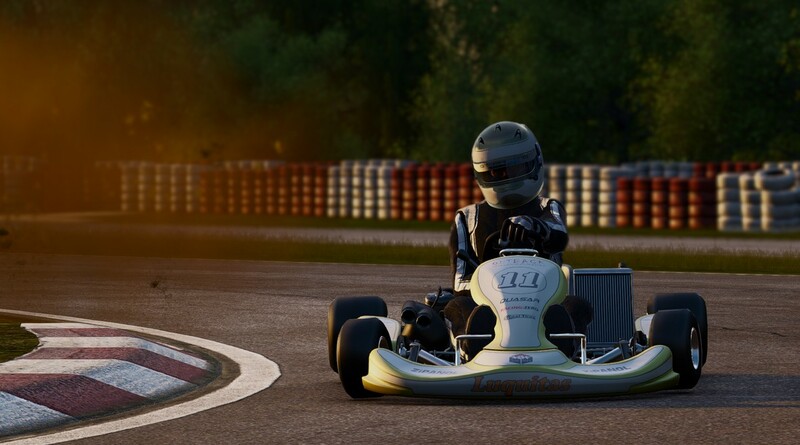 A KF1 kart, with a 125 cc 2-stroke engine and an overall weight including the driver of 150 kilograms has a top speed of 85 miles per hour (137 km/h). It takes a little more than 3 seconds to go from 0 to 60 mph with a 125 cc shifter kart (6 gears), with a top speed of 115 miles per hour (185 km/h) on long circuits." When is Project CARS coming out? November 2014 on Windows, Xbox One, and PlayStation 4. 2015 on Wii U and Steam OS. What game is Project CARS like? Project CARS is a racing simulation so is comparable with popular console franchises Forza Motorsport and Gran Turismo whilst also providing the kind of advanced features usually reserved for PC-only simulators like iRacing and rFactor. Can we upgrade the cars? Since the game covers such a variety of motorsports, each with their own performance restrictions, all vehicles are non-upgradable and come pre-installed with the best parts possible. Can you tune the cars? Yes! Project CARS has a deep tuning system with full control over all aspects of the car's performance. Troubleshoot common problems by checking with the in-game Engineer, get useful hints on technical details via the Digital Manual, and visit the dedicated Test Track to see how your changes perform out on the tarmac. How many tracks in the game? Project CARS has the largest track roster of any recent racing game. It looks like many people here are looking for the original manufacturers specifications. I wanted to tell everyone about VehicleBios.com. It has free access to all specs for almost every auto and truck ever built! Hope this helps some people. Thank you, Rashida, Ten Doves"
Project Cars will be released in the 2015. All images and videos present here are Work In Progress.. Simple theme. Theme images by chuwy. Powered by Blogger.